Solace | Can Bryan Write? I had heard of memorial tattoos in the past, typically those emblazoned with names and dates. More recently with the evolution of the art form, portrait types have become popular. I had even heard something about a more extreme commitment, using a little cremation ashes in the ink. I have collected a few tattoos over the years, prior to their current popularity. They are mostly personalized designs; with no special meaning attached other than being decades’ old souvenirs of simpler times. So the idea and realities of inked skin was not new to me. I pondered the idea, with my twist. The thought of replicating some of Sarrah’s favored spots around what I already had, seemed appealing to me. I went to a tattoo convention January Twenty Second, Two Thousand Eleven, in Marysville. This in itself was an interesting and distracting new experience that I found to be mostly tailored to the kind of artwork that I already had. Out of all of the colorful artists I found a few potentials and let my mind work further. If I decided to have this done, I wanted the right vibe to be part of the experience, in some kind of appropriate atmosphere, where the intent of meaning could be felt. I did some internet surfing of these possibilities, viewed more of their artworks and refined my search. I visited the Hidden Hand tattoo parlor in the unique neighborhood of Fremont, tucked under a building; interestingly just down the street from where Sarrah had gone for acupuncture and ultimately her last trip. I met with the artist Roni, who combined with the atmosphere and locale, seemed right. 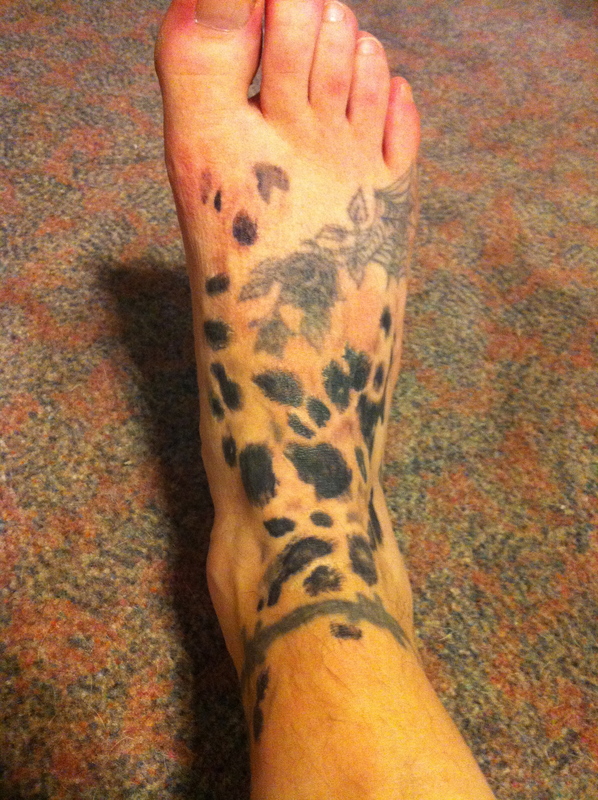 I gave her artistic freedom with photos of Sarrah and tracings of my foot. My initial reaction to her emailed design was, “Wow, that’s bigger than I had envisioned” but I kept it to myself to live with the idea. And like Sarrah, the artwork quickly grew on me. I decided that a design to honor my best friend, deserved Big. The unedited work of art with some of Sarrah’s ashes in the black ink was done June Seventeenth, Two Thousand Eleven; on what would have been her 13th birthday. Now, she can walk with me… for the rest of my journey. I am not promoting tattoo’s in any way (I actually liked them more before the herds gravitated), but to my un-expecting open mindset, I did feel some relief in the pain of it. The artwork healed nicely and serves me with a little visual solace, which most likely only I understand, making it better.